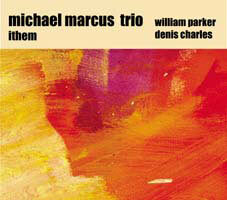 Michael Marcus is a well-known partner to saxophonist Sonny Simmons but in 1993, he was on his own and formed a trio with two of the big creators of free jazz; William Parker and Denis Charles. The trio “rehearsed” and recorded in a studio and some months later the trio performed in a festival at Knitting Factory in NYC. This CD documents music from both occasions.